Rare earth magnets and optimized rotors designed for maximum torque, and high efficiencyStators with maximum winding fill for lower temperatures, long life and maximum torqueLarge ball bearings, also optimized for short repetitive moves to ensure long life. Stepper motors, with their ability to produce high torque at a low speed while minimizing vibration, are ideal for applications requiring quick positioning over a short distance. Stepping technology allows for the use of an open-loop controller – simplifying machine design and lowering total cost compared to a servo motor system. Not really sure how step motors work? Review the three basic types of step motors and understand how these simple yet powerful devices create rotary motion. Stepper Motors provide precise position and speed control, without the need for feedback devices to sense position. The operation of step motors is controlled through electrical pulses that the drive converts to current flowing through the windings of the motor. As the current is switched the motor rotates in precise steps of a fixed angle. The motor and drive constitutes a low cost control system that is precise and simple to construct. • Accurate Position ControlThe number of control pulses defines the motor shaft position. Position error is very small (less than 1/10th of a degree), and non cumulative.A stepper motor rotates with a fixed step angle, just like the second hand of a clock. This angle is called "basic step angle." MOONS' offers several types of "basic step angle" as standard motors: 2-phase stepping motors with a basic step angle of 0.9° and 1.8° and 3-phase stepping motors with a basic step angle of 1.2°. Besides the standard motor, MOONS' also has stepper motors avalible with other "basic step angle." They are 0.72°, 1.5°, 3.6° and 3.75°, these motors are not listed in the catalog, please contact MOONS' for details.• Precise Motor Speed Step motor running speed, is exactly determined by the frequency of the control pulses. Because the speed is very precise and easy to control, step motors are often used where coordinated motion control is needed. • Forward & Reverse, Pause and Holding Function Motor torque and position control is effective throughout the entire speed range, including zero speed holding torque. The zero speed holding torque locks the shaft at the desired position to hold the load in place. • Low Speed Operation Step motors produce a large amount of torque, and are easy to control, at low speeds. This often eliminates the need for speed reduction gearboxes, reduces costs and saves space. • Long Life The brushless design of step motors leads to motors with a very long life. Step motor life is usually determined by the life of the bearings. MOONS’ stepping motors are widely used to create the motion needed in many types of equipment. The stepper motor is an electromagnetic device that converts digital pulses into mechanical shaft rotation. Advantages of step motors are low cost, high reliability, high torque at low speeds and a simple, rugged construction that operates in almost any environment. Typical stepper motors are 1.8 degrees per step, which is 200 steps per revolution. Some stepper motors are able to move in very small increments. In this example, it moves 0.9 degrees per step or 400 steps per revolution. A phase (or step) is the momentary condition of the stepper motor: which coil(s) is (are) energised and in which direction. For the 4-coil version each phase has current flowing through one of the 4 coils. Most modern drives implement microstepping to increase resolution and motion smoothness. Most common stepper resolution is 200 full steps per revolution but when driven for example with 16-microstep drive, the resulting resolution is 1600 steps per revolution (1/1600 revolutions). To change direction you need to reverse the current in one set of coils only. At the moment the two motors are connected in parallel and turn in the same direction. Swap ONE of the coil pairs over and you should be able to get the two motors turn in the opposite direction with the same drive signal. 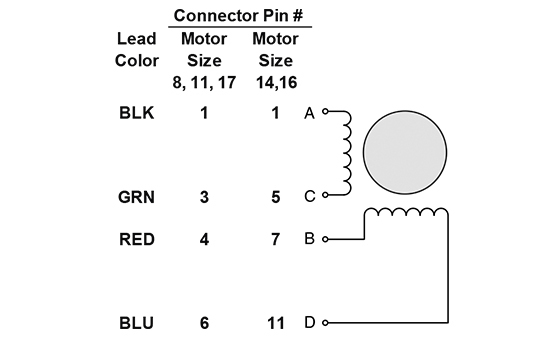 To begin, if your stepper motor only has four wires, this means it can only be used with a bipolar driver. You will notice each of the two phase windings has a pair ofwires, use your meter to identify the wires. 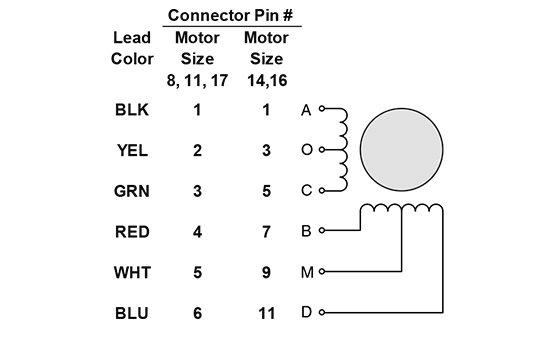 Find the wires that have the continuity between them and connect these to the stepper motor. If external force is applied to a stepping motor when it is stopped but energized, the attractive force generated between the rotor and stator works to maintain the stop position of the motor. This torque of withstanding the external force is called theholding torque. In response to each individual control pulse and direction signal, the drive applies power to the motor windings to cause the rotor to take a step forward, a step in reverse, or hold in position. For example, in a 1.8 degree two phase step motor: When both phases are energized with DC current, the motor will stop rotating and hold in position. The maximum torque the motor can hold in place with rated DC current, is the rated holding torque. If the current in one phase is reversed, the motor will move 1 step (1.8 degrees) in a known direction. If the current in the other phase had been reversed, the motor would move 1 step (1.8 degrees) in the other direction. As current is reversed in each phase in sequence, the motor continues to step in the desired direction. These steps are very accurate. For a 1.8 degree step motor, there are exactly 200 steps in one revolution. Two phase stepping motors are furnished with two types of windings: bipolar or unipolar. In a bipolar motor there is one winding on each phase. The motor moves in steps as the current in each winding is reversed. This requires a drive with eight electronic switches. In a unipolar motor there are two windings on each phase. The two windings on each phase are connected in opposite directions. Phase current is reversed by turning on alternate windings on the same phase. This requires a drive with only four electronic switches. Bipolar operation typically provides 40% more holding torque than unipolar, because 100% of the winding is energized in the bipolar arrangement. Rules of thumb and best practices for using and installing step motors. 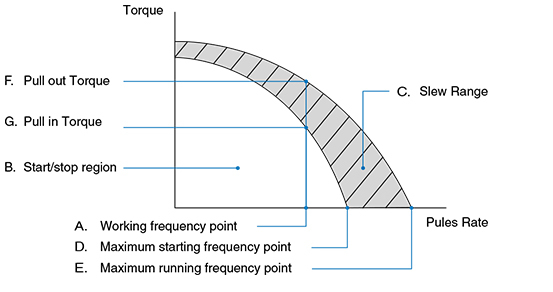 The dynamic torque curve is an important aspect of stepping motor’s output performance. The followings are some keyword explanations. A. Working frequency point express the stepping motors rotational speed versus the drive pulse rate. E.g. : 1.8° stepping motor, in the condition of I/2 subdividing (each step 0.9°) runs at 500Hz its speed is 1.25r/s. C. Slew Range: the motor cannot be started directly in this area. It must be started in the start/stop region first and then accelerated to this area. In this area, the motor can not be directly stopped, either. Otherwise this will lead to losing-step. The motor must be decelerated back to the start/stop region before it can be stopped. The torque meeded to accelerate the system inertia is often larger than the friction torque of the load. This limits how quickly the load can be accelerated. As shown by the following graph: the dynamic torque performance of a stepping motor is constant at low speeds. But at higher speeds, the torque drops as speed increases (influenced by the motor inductance and drive voltage). A. 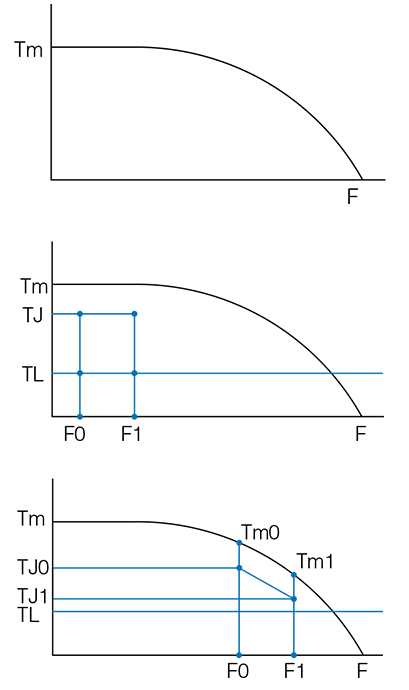 Accelerated Motion of Straight Line Motor’s load value is known as TL, it has to be accelerated from F0 to F1 in the shortest time(tr), what is the value of tr? Note: J is the rotational inertia of motor rotor plus the load, q is the angle of each step, it equals the step angle of stepping motor when motor runs in full step. A. Have the motor operate outside of this speed range. B. Micro-step is used for increasing a motor’s step resolution. By adopting the micro-step driving method, you can divide one step into multiple steps thereby reducing the vibration. This is accomplished by controlling the motor’s phase current ratio. Micro-step does not increase step accuracy. However it will allow a motor to run more smoothly and with less noise. When the motor runs in half step mode the motor torque will be 15% less than running in full step mode. If the motor is controlled by sine wave current the motor torque will be reduced by 30% if using the same peak current. C. Use 0.9° 2 phase step motor, or a three phase step motor. Moons’ uses high quality bearings optimized for step motors for long life from every motor. To meet the most demanding applicatons. Most motors can also be provided with larger bearings shafts and custom construction. 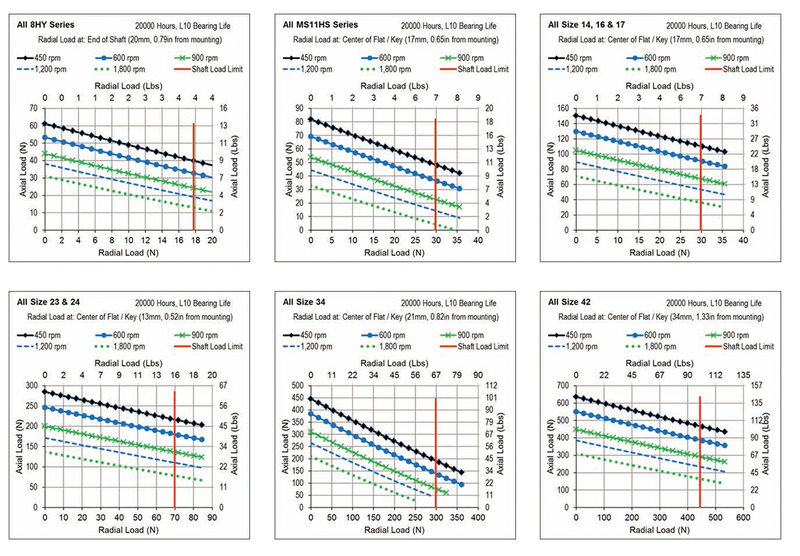 These bearing life curves represent the maximum axial and radial loads for 20,000 hours L10 bearing life at various speeds. 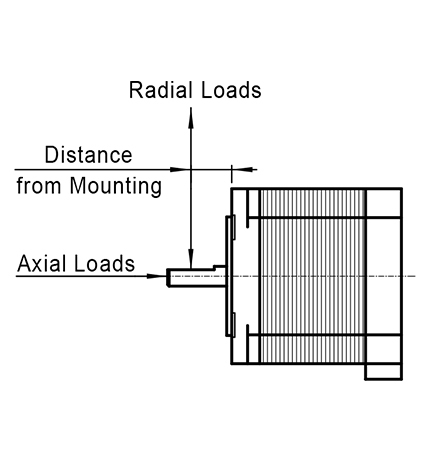 The shaft radial load limit (and bearing load ratings) are highly dependent on the the distance from the mounting face where the load is applied. These curves were calculated with the radial load applied at the distance from the mounting face shown on the curve (usually the center of the flat / keyway). A common cause for shaft (and bearing) failure, are high radial loads that are created when a pulley is attached to the motor shaft at a large distance from the motor mounting face, and the belt has high tension. To avoid this condition mount pulleys and gears as close to the face of the motor as possible, and avoid over tightening belts. This will dramatically reduce the shaft stress, and increases the life of the bearings. Ever wonder what “pull-in torque” means? Find out that, and more, here. 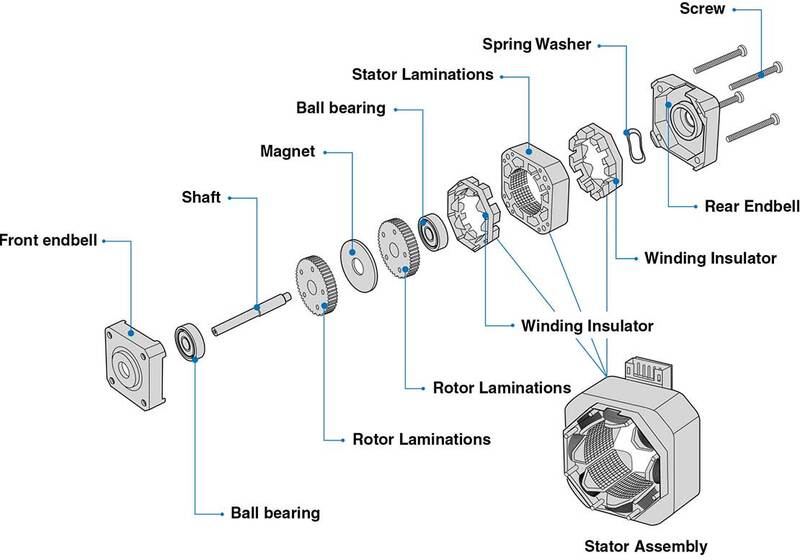 MOONS' designs and manufactures three main types of stepper motors: Hybrid Stepper Motors, Permanent Magnet Stepper Motors, Closed Loop Stepper Motors (Step-Servo motors). We provide our customers with a wide selection of step motors with a range of: sizes, phases, and step angles as well as Custom Components & Custom Motors - Shaft, Lead Wires & Cables, Encoders, Pulley & Gear, Brake, IP Ratings, etc. MOONS' is one of the largest integrated manufacturers of motion control in China with 20+ years of stepper motor R&D history and the yearly shipment of over 10 million of stepper motors worldwide. Especially designed for thousands of Engineers and Experts, MOONS' stepping products are renowned for High Quality, Widest Selection, High Performance and Unique Features. We always work with you together to get your creative ideas or innovative products to go to market as fast as possible. MOONS' - Experts' Choice! MOONS' stepper motors and motion control products are widely applied in many innovative applications, including: 3D Printers, extruders, stage lighting, CNC machines, analytical and medical instruments, packaging machinery, precision telescope positioning systems, laser cutters, Security Camera, engravers, image scanners, textile equipment, embroidery machine and robotics etc.